Huber Ministats are one of the smallest cooling circulators in the world and their small dimensions allow Ministats to be placed in the smallest of spaces, for example in a laboratory fume cupboard or inside a technical plant. 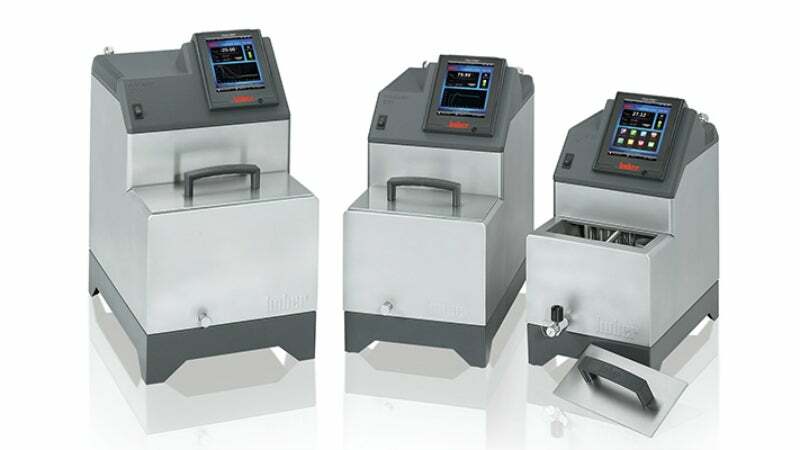 Despite their minimal size, the systems are extensively fitted out and offer sufficient performance for temperature control of photometers, refractometers, viscometers, distillation apparatus, reaction vessels, and mini-plants. The main applications are external, however the bath opening allows objects to be thermoregulated directly in a thermostat bath. A powerful pressure/suction pump, with an infinitely controlled rotational speed, ensures optimal circulation. The maximum pressure can also be regulated by an optional pressure sensor, meaning sensitive glass reactors and apparatus can reliably be protected from breakage. In addition, Ministats offer the professional level Pilot ONE controller, with a colour thin-film transistor (TFT) display and comfortable operator guidance. Analogue connections according to NAMUR are available via the optional Com.G@te module allowing Ministats to integrate into plant and process control systems.